We will send you payment information (PayPal) in few days. Your registration will not be confirmed until we have received your payment in full. The registration fee for 2 days is 10,000 yen, including lunch (light food). Registrations canceled before 14th June receive a full refund. Please contact by email to cancel your contract. 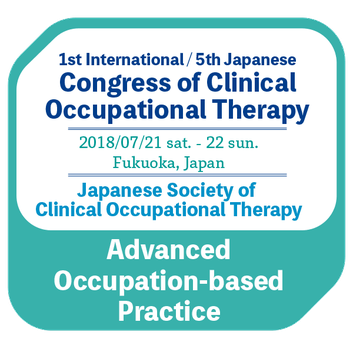 The Japanese Society of Clinical Occupational therapy welcomes the submission of original contributions for oral and poster presentation at the Congress. Clinical practice and clinical research of occupational therapy are widely recruited. There are 2 types of presentation: Oral and Poster presentation. Please select your preferred type of presentation at the point of submission. However, please kindly be reminded that your assignment will be determined by the program committee. Presentation time is 7 minutes, Q & A session is 3 minutes (Total 10 minutes). ※ We will inform you about presentation environment (PC specification etc) at the time of accepted abstract. ※ Presentation time may change due to the number of presentations / schedule adjustment. We will have a free discussion form with the audience in front of the posters (there will be no chairpersons, interpreter volunteers will be placed at the venue). ・ All abstracts must be written in English and via the online ONLY. If you do not use English as your native language, we strongly encourage you to take a native check on the final English abstract. ・ Title (Max. 25 Words): The title should be as brief as possible. If you wish to include a subtitle, it must be included in this field and included in the 25 words limit. ・ Abstract (Max. 250 words): Any abstracts exceeding the word limit will not be accepted (excluding title, authors and affiliations). ・ Abstracts should not include any diagrams, charts or reference citations. ・ Oral and poster abstracts MUST include: Introduction/Rationale, Objectives, Method OR Approach, Results OR Practice Implications, Conclusion. Abstracts without this structure will not be accepted. ・ Each author can submit only one abstracts. ・ The number of co-authors is limited to 5 persons per abstract. ・ Conflict of interest: Indicate that you agree to provide a statement on any potential conflicts of interest at the commencement of the presentation and / or on any slides or posters. ・ Research ethics and patient consent: Please ensure that you have provided the full name and institution of the review committee, in addition to the approval number. Also, information on informed consent to report individual cases or case series should be included in the abstract text. ・ The secondary usage rights and license rights of the abstract belong to the Japan Society of Clinical Occupational Therapy. ・ Notifications of acceptance or rejection of the abstracts from the regular submission is in March 2018. ・ With the notification of acceptance, abstract presenters will be informed about the time and date of their presentation, and are asked to reconfirm their attendance. ・ The acceptance of an abstract does not imply provision of travel, accommodation or registration for the congress, nor any other costs associated with preparation.